In 1780 England, William Herschel and his sister Caroline are building homemade telescopes in an attempt to reach the future and an uncatalogued star. In the future on the trash planet Uranus, two siblings are traveling backwards in time in an attempt to re-collect everything they have ever thrown away. A tale of progress and consumerism inspired by Grimms’ Hansel and Gretel, and the ancient Greek origin story. In 1780 England, William Herschel and his sister Caroline are building homemade telescopes in an attempt to reach the future and an uncatalogued star. In 2080 on the planet Uranus, two siblings are traveling backwards in time in an attempt to re-collect everything they have ever thrown away. A tale of cycles, legacy and industry inspired by contemporary problems of waste, Grimms’ Hansel and Gretel and the Greek origin story. Can we move forward without leaving something behind? Can we value the past without hindering progress? URANUS was written by Jeremy Pickard, and was a semi-finalist for the 2009 Eugene O’Neill National Playwrights Conference. 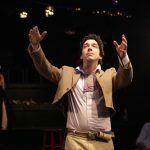 It was developed in 2007 at the Oracle Club in Ithaca, NY, and a first draft was produced in 2008 with Upright Egg Theater Company in Minneapolis. A second draft was produced in NYC in 2010, and a third draft was written and read in 2015 at VoxFest at Dartmouth College. On the morning of his birthday, an employee of Enrich Water Co. hears the voice of a dying god in his bottle of water, and soon finds himself transforming into a fish. Meanwhile, a young woman undertakes a journey across the warming ocean to find her lost brother. A tale inspired by H.C. Andersen’s The Little Mermaid and The Snow Queen exploring sacrifice, sea level rise, and the world water crisis. On the morning of his birthday, an employee of Enrich Water Co. hears the voice of a dying god in his bottle of water, and soon finds himself transforming into a fish. Meanwhile, a sea creature undertakes a journey across the warming ocean to find her lost brother. An exploration of sea level rise and the world water crisis inspired by the fairy tales of Hans Christian Andersen. What are we willing to sacrifice to preserve our way of life? NEPTUNE was originally co-created by Brielle Korn, Jeremy Pickard, and Sarah Hughes, and presented at NYC’s Flux Factory in 2009. It was developed in 2008 thanks to a residency at The Dragon’s Egg retreat space. A second draft of NEPTUNEbegan development in May 2015 as part of the “Rising Waters Confab”, a residency with the Robert Rauschenberg Foundation. Performed by Preston Copley, Brielle Korn, Zoe Mey, and Jeremy Pickard. Additional participants in developmental workshops included James Ryan Caldwelland Valerie McCann. In 1780 Danbury, Connecticut, Zoe Benedict has stumbled upon a process by which to make hats using a nitrate of mercury. Renewed with revolution and purpose, Zoe launches the first American hatting industry. Business goes mad-- but so does Zoe, as the mind of the man and the environment of Connecticut turn toxic. An adventure based on Lewis Carroll’s Alice stories, Danbury legend, and the legacy of heavy metal contamination. In 1780 Danbury, Connecticut at the height of the Revolutionary War, sad sack Zoe Benedict has stumbled upon a process by which to make hats using a nitrate of mercury. Renewed with revolution and purpose, Zoe launches the first American hatting industry. Business goes mad, but so does Zoe, and his simple feat of entrepreneurship transforms into a nightmare as the mind of the man and the environment of Connecticut turn toxic. An adventure based on Lewis Carroll’s Alice stories, Danbury legend and the problem of heavy metal contamination. How do we progress without knowing the consequences? MERCURY was co-created by Brian Belcinski, Alison Marie Bryant, Tommy Dickie, Danny Gardner, Corey Johnson, and Jeremy Pickard. A first draft of MERCURY was developed over the course of 2007-2008 in NYC and at The Dragon’s Egg retreat center in Connecticut, and was produced at The Tank in NYC. A second draft was made in 2009 and subsequently toured to southern Connecticut and premiered at Flux Factory in NYC. Jack and Rhea have inherited a farm. Newly 30 and newly wed, their bucolic way of life is a welcome change, until three mysterious seeds put the fate of the farm —and their marriage— at stake. Now the couple must piece together the past in order to make peace with the future. A riff on the myth of Kronos, Jack and the Beanstalk, genetic agriculture, and our contemporary relationship to food. Jack and Rhea have inherited a farm. Newly 30 and newly wed, their bucolic way of life is a welcome change, until three mysterious seeds put the fate of the farm —and their marriage— at stake. Now the couple must piece together the past in order to make peace with the future. A riff on the myth of Kronos, Jack and the Beanstalk, genetic agriculture and our contemporary relationship to food. What do we grow, and how do we grow it? 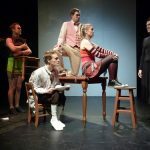 SATURN was co-created by Sarah Hughes, Maria Portman Kelly, Megan McClain, and Jeremy Pickard in collaboration with the company. It was written by Jeremy Pickard with dramaturgy by Megan McClain. A first draft of SATURN was produced in 2011 at The Tank in NYC, and a second draft was produced in 2012 at Wild Project in NYC. It was developed over the course of 2010-2012, thanks to residencies at Full & By Farm, SPACE on Ryder Farm, and The Dragon’s Egg retreat center. A couple faced with the possibility of having a child embark on separate journeys through time and space. An immersive event exploring the personal, social and environmental questions surrounding contemporary issues of overpopulation, created in collaboration with audience members and international artists inspired by the Voyager Golden Record project. A couple faced with the possibility of having a child embark on separate journeys through time and space. An ever-changing theatrical event exploring the personal, social and environmental questions surrounding contemporary issues of overpopulation. Created by audiences and local artists in collaboration with international teams of artists and scientists based on limitations inspired by the Voyager Golden Record. EARTH is co-created by Jeremy Pickard, Megan McClain, Hannah Wolf, and many collaborating artists. It was originally conceived by Sarah Hughes, Jeremy Pickard, and Anne Zager. The script is being written by Jeremy Pickard, with dramaturgy by Megan McClain. The piece has been in development since 2012, thanks in part to a Process Space grant from the Lower Manhattan Cultural Council, a residency with The Drama League, and the generosity of SITI Company. Performed by Nanda Abella, Jonathan Camuzeaux, Janouke Goosen, Eben Hoffer, Mauricio Pita, Isabella Sazak, Sonia Villani, and Samuel West. Displaced Appalachians resettled on Mars face a familiar dilemma when their leader initiates a questionable mining operation. A dance-theater event adapted from a graphic novel and inspired by the history of Appalachian coal mining. Displaced Appalachians resettled on Mars face a familiar dilemma when their leader initiates a questionable mining operation. A dance-theater event adapted from an original graphic novel, featuring projected illustration and a live musical score. Inspired by the history of Appalachian coal mining. MARS was co-created by Kristy Caldwell, Tom Coiner, Adam Miller, Adam H. Weinert, and Jeremy Pickard. 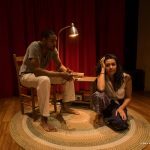 It was first seen in 2013 at Brooklyn’s Center for Performance Research, produced in partnership with Matchboxarts and presented by Chez Bushwick thanks to a grant from the Mertz Gilmore Foundation. It was developed over the course of 2011-2013 at The Dragon’s Eggretreat center, Makehouse, and Dixon Place. In the distant past, refugees fleeing the warming planet Venus attempt to cross the border of a new world. A dance-theater duet inspired by the stories of Ursula K. Le Guin exploring migration caused by climate change. In the distant past, refugees fleeing the warming planet Venus attempt to cross the border of a new world. A dance-theater duet exploring migration caused by climate change and inspired by the stories of Ursula K. Le Guin . Who are we when the the territories we created to define us no longer exist? A third draft of VENUS, focusing on climate refugees, is currently being developed under the leadership of Isabella Sazak and the guidance of refugee expert Isabelle Glimcher. VENUS was originally “a play about energy”. It focused on a group of expatriates living on the terraformed planet Venus, generating their own power through utopian acts of community, and the inevitable downfall instigated by the surprise appearance of an alien. The first draft of VENUS was produced at FringeNYC in 2009. A second draft was developed in partnership with Upright Egg Theater Company in Minneapolis, MN and produced in 2010 at the Minneapolis Fire Hall & Museum. Both the first and second drafts were co-created by the collaborating artists. Bike-powered LED lights were utilized in the Minneapolis production, thanks to a local organization. Performed by Brian Belcinski, Olivia Gilliat, Maria Portman Kelly, Dan Lawrence, Tina Mitchell, Brian O’Neal, Dave Sleswick, Katia Rocker, andKelsey Siepser. Performed by Mark Benzel, Jason Bucklin, Kelsey Cramer, Kate Gunther, Kelsey McMahon, Dave Mercer, Brian O’Neal, Danielle Siver, Larissa Shea, Peter Shultz, Brian Watson-Jones, and Anne Zager. Before retreating to the planet Jupiter, a young tycoon overhauls the entire energy system on Earth. His imposed vision promises to halt climate change, but demands costly sacrifices from all citizens of the world. A duet inspired by Frankenstein and energy policy. Before retreating to the planet Jupiter, a young tycoon overhauls the entire energy system on Earth. His imposed vision promises to halt climate change and improve Humanity, but demands costly sacrifices in the process. A trio inspired by Frankenstein and energy policy. Should we impose radical societal change for the greater good? JUPITER was co-created by Jonathan Camuzeaux, Lani Fu, Simón Adinia Hanukai, Megan McClain, and Jeremy Pickard. 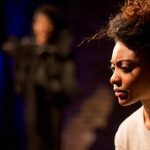 The script was written by Jeremy Pickard, with dramaturgy by Megan McClain and Lani Fu. The music was composed by Jonathan Camuzeaux. 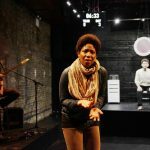 JUPITER premiered in February 2016 at La MaMa in NYC, produced in partnership with Kaimera Productions. It was developed thanks to residencies at The Catwalk Institute and MassBliss, a Creative Space grant from ART/NY, and a work-in-progress performance at Stony Brook University’s Staller Center. Our solar-powered lighting design was made possible thanks to an Off-Broadway Greening Grant from the Broadway Green Alliance, and the generosity of engineer Jay Maury. PLUTO is an allegory about extinction... or it used to be, maybe. Three humans attempt to give a presentation about the remains of a play that no longer exists. The fragments seem to suggest the story of a unicorn, a hunter, and a wizard, all struggling to adapt to a rapidly changing world. Facing similar dilemmas, the three humans reenact their findings, searching for hope among the bones. PLUTO is an allegory about extinction… or it used to be, maybe. Three humans attempt to give a presentation about the remains of a play that no longer exists. The fragments seem to suggest the story of a unicorn, a hunter, and a wizard, all struggling to adapt to a rapidly changing world. Facing similar dilemmas, the three humans reenact their findings, searching for hope among the bones. Is a “doomed species” worth fighting for? PLUTO premiered in May 2017 at The Brick in NYC. It was developed over the course of December 2015-December 2016, thanks to Creative Space grants from ART/NYand residencies with Stony Brook University and Lacawac Wildlife Sanctuary & Field Station.